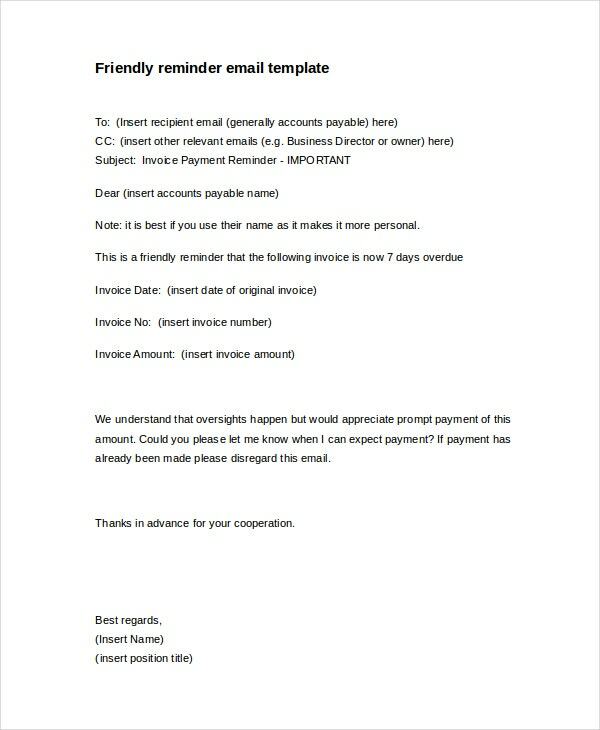 This payment reminder template is written in a very friendly and polite manner and will help you in conveying your message to the defaulter in a polite manner. It is an email template wherein you have to write the email Ids of those you want the letter sent to, the name of the defaulter, date of the invoice along with its number and amount and your name and title as well. 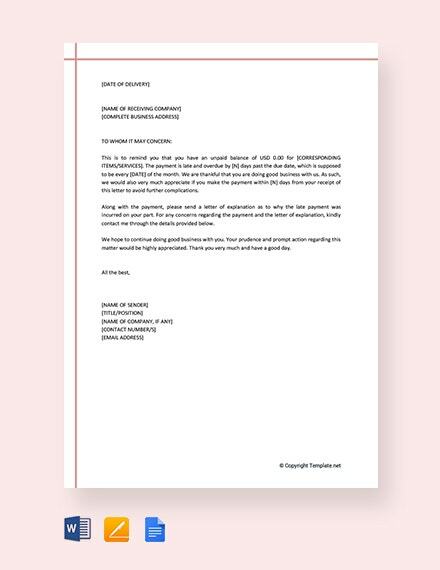 You can also see Business Letter Template. 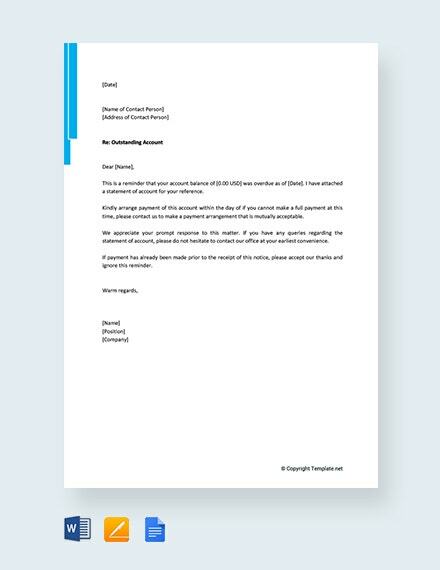 This payment reminder template contains 4 letter templates which are written in very strong tone and are recommended in situations where the payment deadline has been exceeded by a large time period or the amount is very high. It contains courtesy letters as well as those which threaten legal action against the defaulter. The name and address of the debtor has to be filled along with the amount of debt, duration it has been overdue for and period it is applicable for. 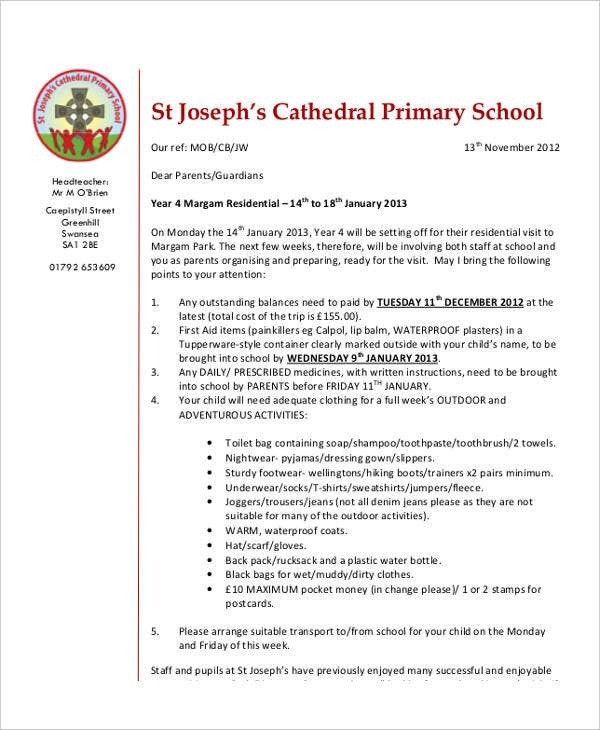 You may also see Collection Letter Templates. 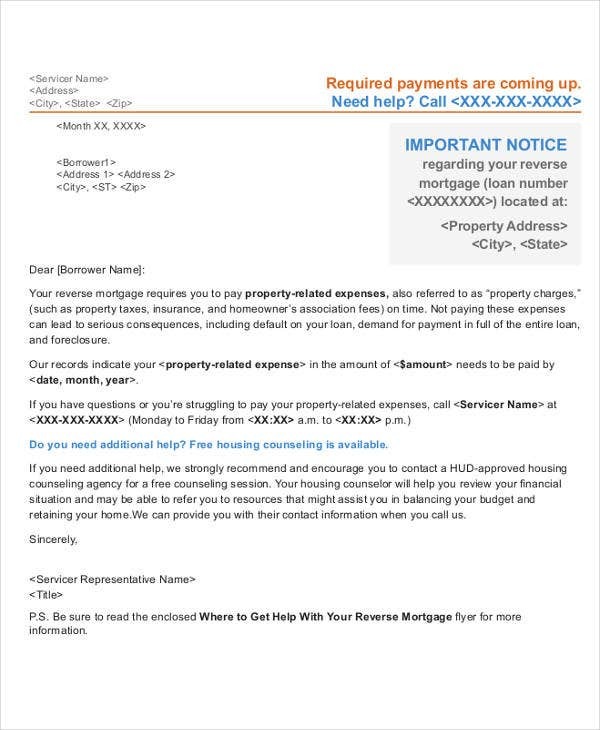 This payment reminder letter template is best suited in a situation where a tenant hasn’t paid his debt and is nearing or has exceeded the deadline for payment. It contains two templates which should be used dependant on the time period between the due date and the date of the letter. The language is neither too lenient nor too harsh and thus will benefit the landlord in keeping a good relationship with their tenant. The name and address of the tenant and landlord along with the value of rent overdue and the deadline should be mentioned in the letter. You may also see Client Letters. 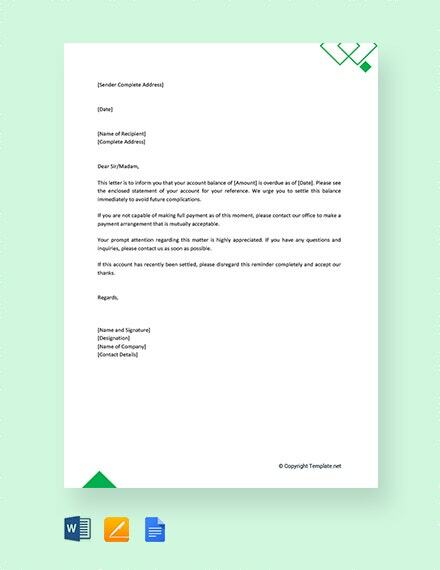 This payment reminder letter template is very generic and can be used in multiple situations where a person or an organisation has to receive payment from another and the debtor has violated the deadlines. It is written in a very polite tone and will help in keeping a healthy relationship between both parties. It requires the name and address of the debtor to be filled along with nature and amount of debt and the number of days it is overdue. 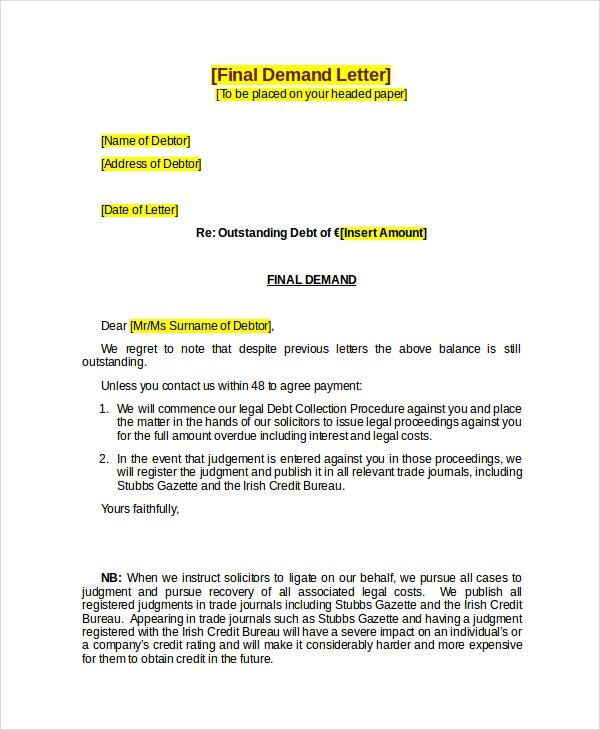 You may also see Legal Letter Templates. 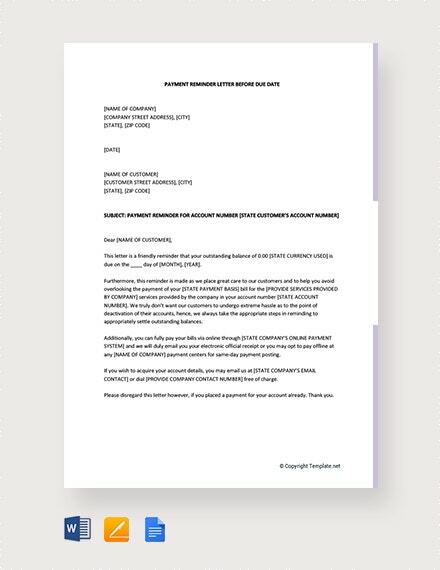 This payment reminder letter template is not very specific and can be used in any situation where a company has to collect money from another and where there is no provision for any extensions of credit in the contract between the two. It is written in a very assertive but respectful manner. The amount of debt, date of deadline along with details of the creditor have to be mentioned in the sample letters. 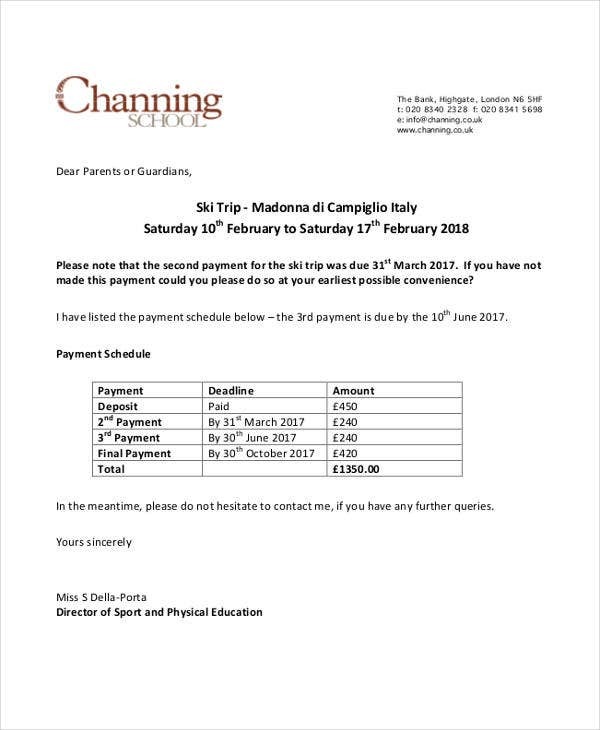 How to Use a Payment Reminder Letter Template? Most payment reminder templates are very easy and straightforward to use with clear instructions given on how to use them. Most of the statements written can be directly used and only some information, which is unique to every situation, has to be filled by you. First, you have to enter the details of the defaulter which includes their name, address and other contact information. Then you write the details of the debt, its amount, nature, time period it is applicable for and days it is overdue by. Then you have to write the payees details, name, and address and contact information (if required in the template). 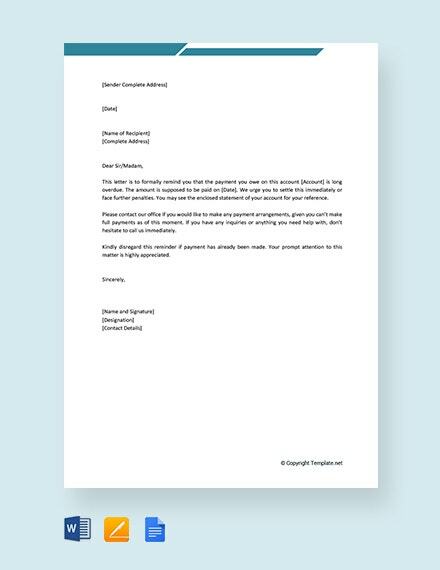 You can also see Resignation Letter Template. 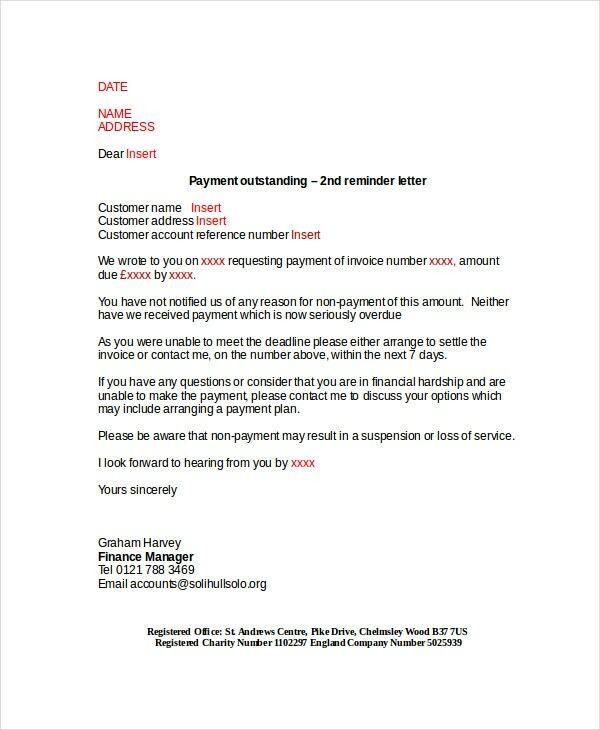 Who Can Use the Payment Reminder Letter Templates? The given payment reminder templates can be used by any two parties between whom transaction of money is overdue and where there is a prior contract which clearly states the possible actions that can be taken by the payee in such situations. 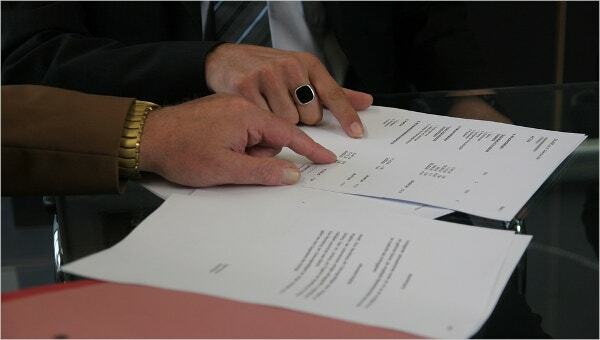 The contract is necessary as it forms the legal basis of sending the letter. 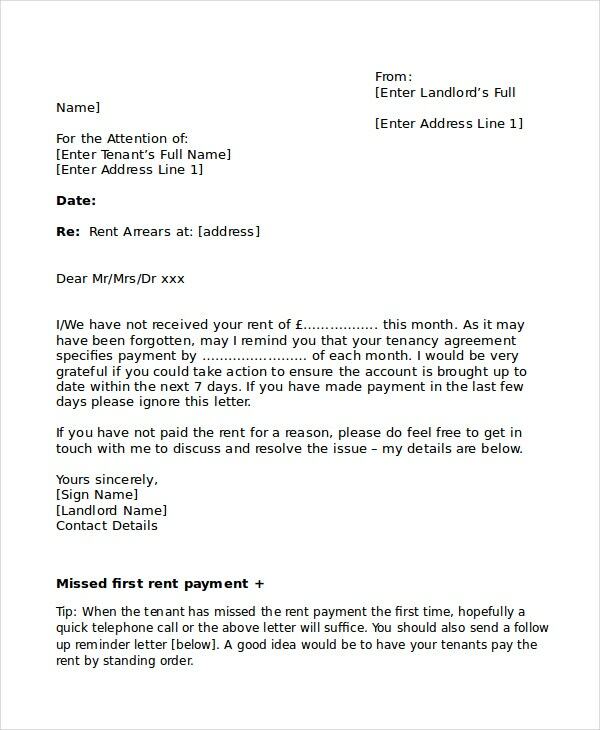 If you are a property owner and your tenant has not paid their rent on time, then you can use these payment reminder templates to either give them a reminder or send an eviction notice in extreme cases. You can also use this if your business is to receive a certain amount from another but they have failed to do so in time. 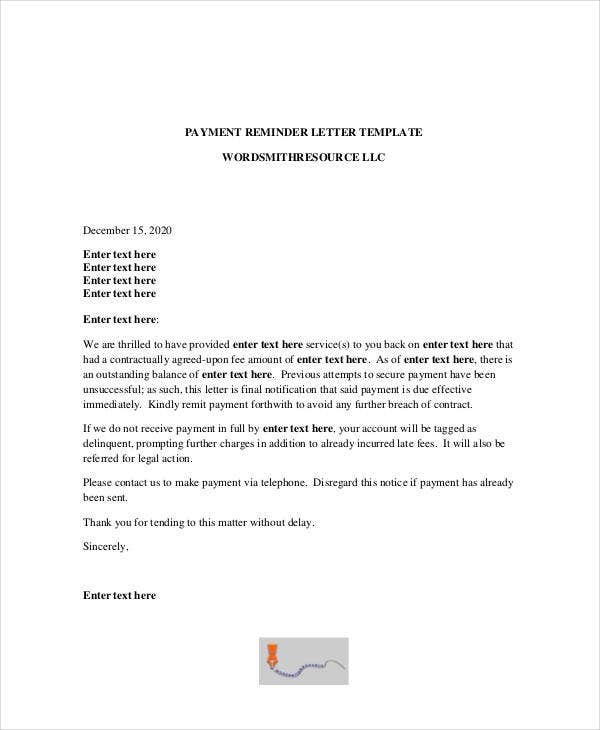 You may also see Marketing Letter Templates. 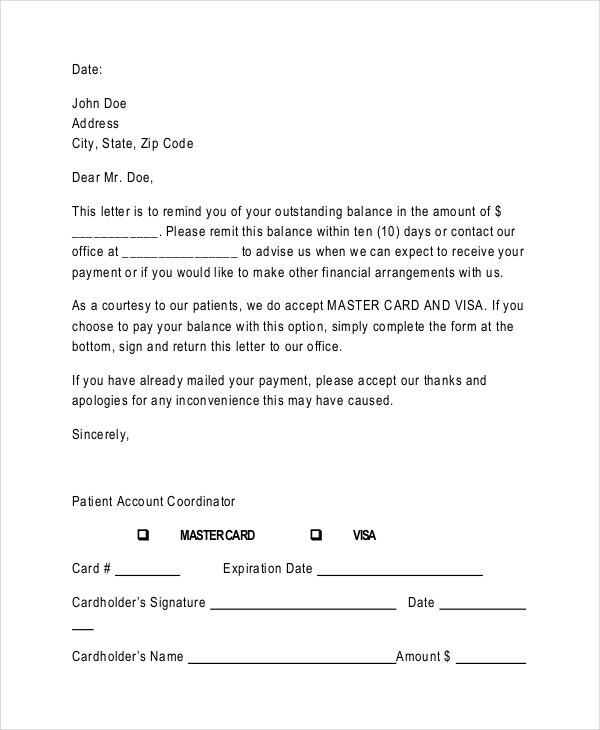 What are the Benefits of Payment Reminder Letter Templates? Writing a reminder letter is not an easy task. There are many factors you have to consider. You have to make sure that you appropriately convey the importance of the money involved for you but you also have to consider the kind of relationship you want to maintain with the defaulter. Keeping all this in mind, you have to carefully choose your words and construct your sentences. Being extremely aggressive can jeopardize your business but too much politeness may not fasten the process of recovery of payment. 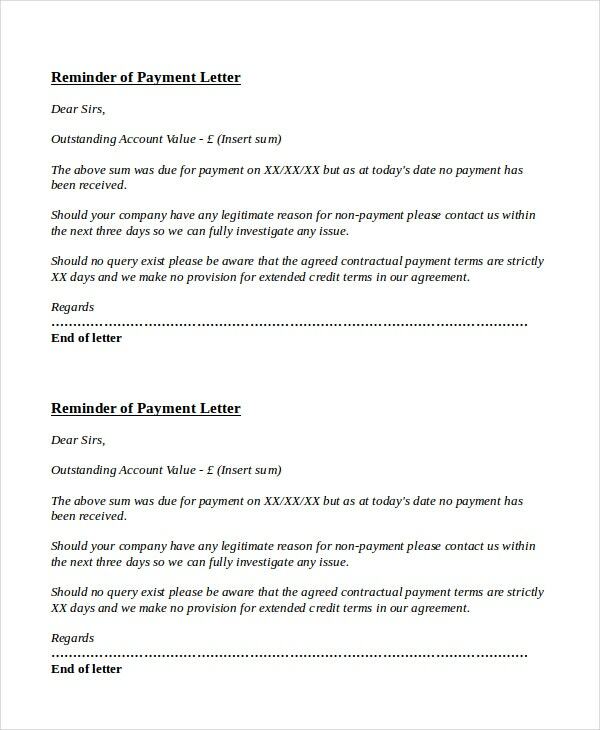 Payment reminder letter templates solve all these problems of yours. Since all the statements are adequately formed with appropriate choice of words, all you have to do is fill data relevant to your situation and in no time and with minimum effort, you get your own payment reminder letter. 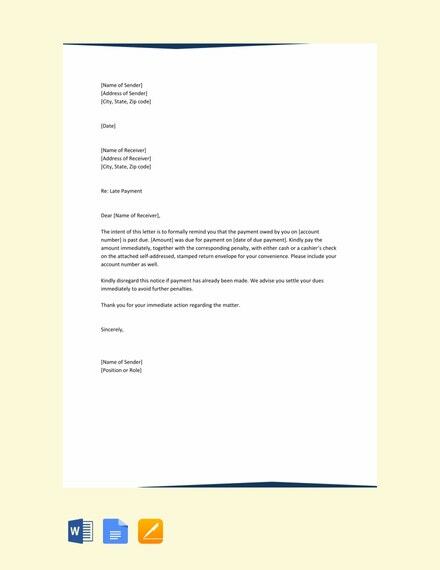 You may also see Appeal Letter Template. 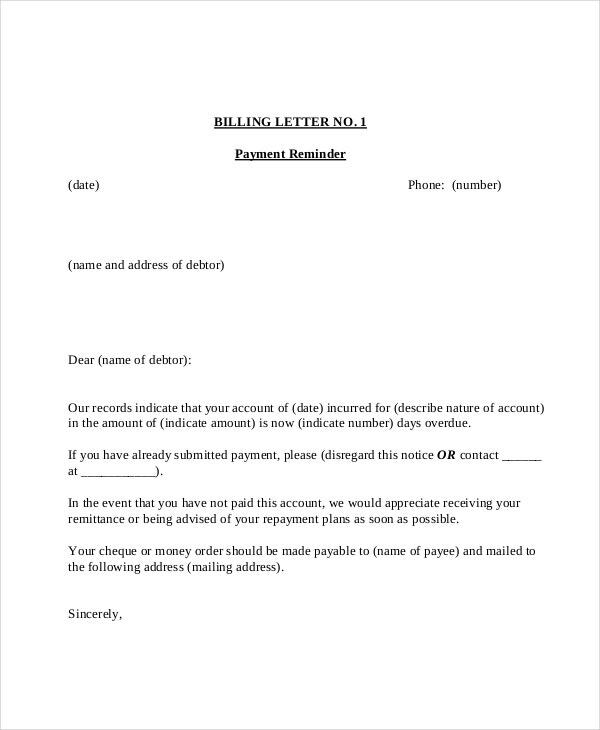 Now that you have all the important information related to payment reminder letters, you may choose the template that best fits your situation and create your own reminder letter without much effort. 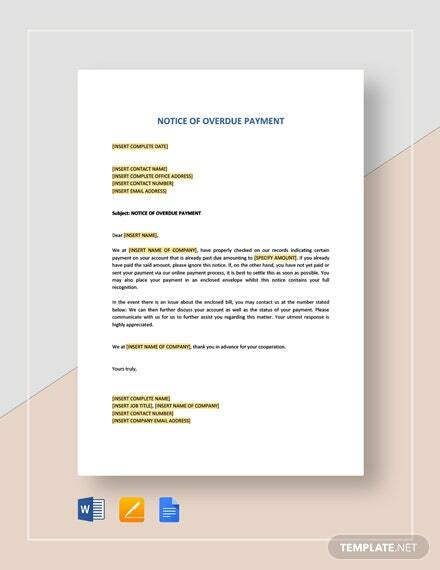 Eviction letter templates should be used in extreme cases where the overdue date has long passed. All the templates have been taken from reliable sources and can be readily used.